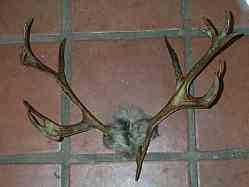 Average Antler, 3 -8 lbs. 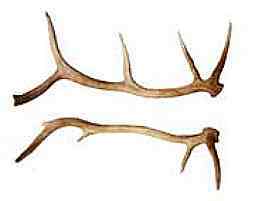 Average Antler, 1/2 - 2 lbs. 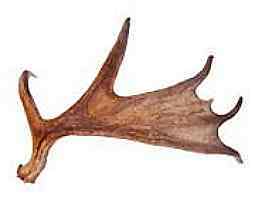 Average Antler,3 - 10 lbs. Have both with and without "crown ". Here are the species names of most current & common antlered & horned North American big game, including ranched antlered game. 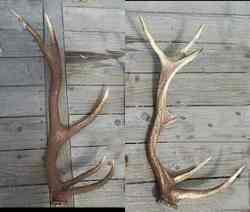 Have shed antlers to sell ? What will we pay ? You are responsible for checking the laws in your home state. All items offered are legal to sell in Wyoming. Into The Wilderness is not offering for sale any item deemed illegal to purchase in your state or location. Please check before you order. We cannot keep up with all the changing local and state antler restrictions and request any updates to your state laws that you may be aware of regarding antler sales. Thank you. 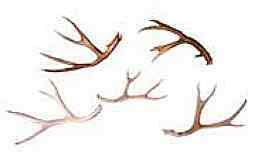 Obviously, a shopping cart will not work for this page, so email, fax, or call us with questions and orders regarding antlers. 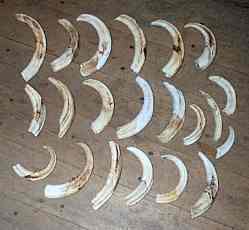 Graded antler prices - less than 2,000 lbs. #1 Brown singles $ 15.00 per lb. #2 Brown $ 13.00 per lb. #1 Hard white $ 10.000 per lb. #2 Hard white $ 8.00 per lb . Chalky $ 5.00 per lb. #1 brown , MD/LG 4 pt $ 18.00 Per lb. #1 brown,all sm ,md $ 16.00 Per lb. #2 brown,all $ 14.00 Per lb. #1 hard white, All $ 12.00 Per lb. #2 hard white,all $ 8.00 Per lb. Chalky,solid $ 5.00 Per lb. Note- the largest single order we will now accept at one time is for 500 lbs. 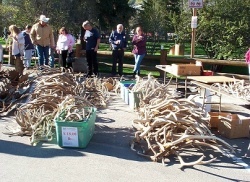 ALL orders of 500 lbs of shed antlers, must now include a 50% deposit with order, or order will not be accepted. NO exceptions . Allow 6-12 weeks for filling your order, subject to availability. Balance required when ready to ship. We will arrange shipping to your specified East Coast or West Coast address at buyer's expense.